There are a few watches that when you see just the dial, you immediately know what watch it came from. This is usually a sad circumstance, as it means someone scrapped a solid gold case for a fraction of what the watch might have been worth. Of course, some watches are worn or damaged beyond repair. So there are legitimate reasons for movements and dials to be sold without a case. You can't really tell from the catalog image what is so special about the dial. But the luminous hands and hour markers are distinctive. In reality, the sterling silver dial has a textured "waffle" finish along with 18K gold numerals and markers along with a golden pearled track. In 1954 the catalog provided a better image and the waffle pattern is much more obvious. It sort of begs the question, is the 1953 dial actually different? If you look closely at the 1953 dial there's a white rectangle around the Hamilton logo - so I suspect the two years have the same dial. Under the dial is an 18 jewel 8/0 sized 748 movement. 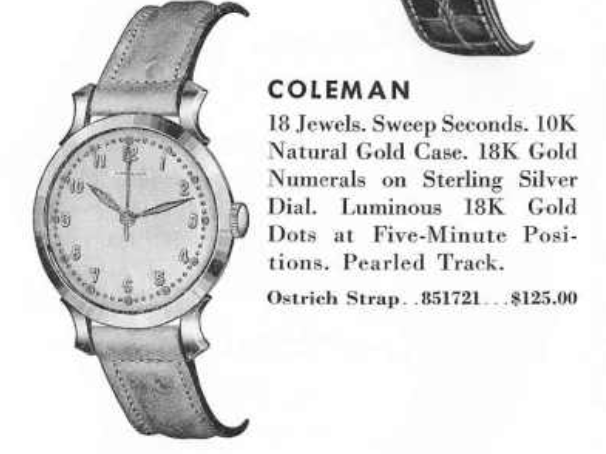 This American-made movement was the only sweep second movement available after the 987S was discontinued in 1947. The 748 was replaced by a shock-jeweled version marketed as the 735 after 1955. The Coleman comes in a solid 10K yellow gold case. I don't know how "rare" the Coleman is but you don't see them very often since they were only made for a single year. I recently picked up a Coleman project watch. I was hoping I would be able to clean up the dial well as I think it would be a very difficult dial to get refinished to original standards. My project watch came with a Speidel expansion bracelet which will have to go. Fortunately, now that the bracelet is off, I can see that the lugs are in good shape and undamaged. That's mainly thanks to a lack of spring loaded ends in the bracelet. Those "one size fits most" spring loaded bracelets can take a serious toll on the inside of watch lugs. The crown on this watch is very worn and will need to be replaced. The bezel just pops off to reveal the dial and hands below. It's rather dirty but not stained so I may get lucky cleaning it. I'll be happy as long as I don't lose the Hamilton logo accidentally.. so nice and easy will get the job done. The shadow is blocking the word "COLEMAN" stamped inside the case back. It's rather dirty inside but no verdigris is present. That's a good way to spot a solid gold case if you don't see any obvious marks... solid gold cases don't show green corrosion like gold filled cases will. There are quite a few service marks inside. Service marks are an indication that the watch was well cared for by it's initial owner. If you find a watch in worn condition with lots of service marks, it's a sign that the watch was well used, but well maintained. That's better than a worn watch without serviced marks - that movement may have had a hard life. A pristine watch without service marks may indicate the watch was so special, it was never used... a cream puff. I apologize for the blurry photo. The movement is unremarkable except most of the black enamel in the engraved printing is missing. You see this occasionally and I suspect its from a vigorous cleaning machine in the watch's past. The back of the movement is unscathed so that's a good indication that the dial is original. Of course, the other side of the dial is a good indicator too. Everthing is disassembled and cleaned. It all goes back together with several different lubricants in various key places. The reassembled movement goes onto the timer to see how it's performing. I can often tell when it's going to be "bad news" but just because it looks like it's running well, doesn't mean that it is running well. Well, it's running a little slow but the amplitude is good and the beat error is acceptable. I like to see a beat error of under 1 but I'll usually accept anything under 3 when the balance doesn't have a moveable hairspring stud. A couple of tweaks to the regulator is all that is needed to bring the timing back in line. While the movement was being cleaned I relumed the dial markers and hands. A new crystal is an inexpensive way to drastically improve the look of a project watch. This one takes a 30.1mm diameter crystal. A genuine leather strap is the last thing added to complete this Coleman's restoration. The dial turned out great, just one little spot near the 8 was too stubborn to be removed. I think the project turned out great. What do you think? Beautifully done, mind sharing which lume you used on this beauty! I use Bergeon 5680B-07 White Luminova and sometimes I mix a little green in too just to give it a little contrast. A wonderful restoration of a unique watch. I love the way the lugs have a curve to them and the interesting waffle dial. This is an awesome job Dan! And I am proud to add it to my collection :-) I wear it daily as it is currently the favorite among the watches I own...thanks again Dan!